Longevity is important for any business, but when you’ve been around town for seven years like Japanese restaurant Harakan has, then a fresh coat of paint every once in a while never hurts. Shedding its former fine dining leanings, the newly renovated and rebranded Harakan-S feels a lot less serious and stuffy than before thanks to the bright neutral tones and green foliage wall that looks straight out of a modern Scandinavian home décor magazine. Aside from the physical facelift though, the restaurant’s reopening also provides a much-needed chance for the chefs to exercise their artistic talents and revise Harakan’s previous tradition-fuelled menu. One of the new headliners here is the creative sushi. The deluxe assorted platter ($498) includes nine bite-sized mounds of rice blanketed with fresh seafood and dressed in different sauces or pastes. It’s not wildly revolutionary but the condiments are all chosen specifically to enhance the flavours of the fish it’s paired with. 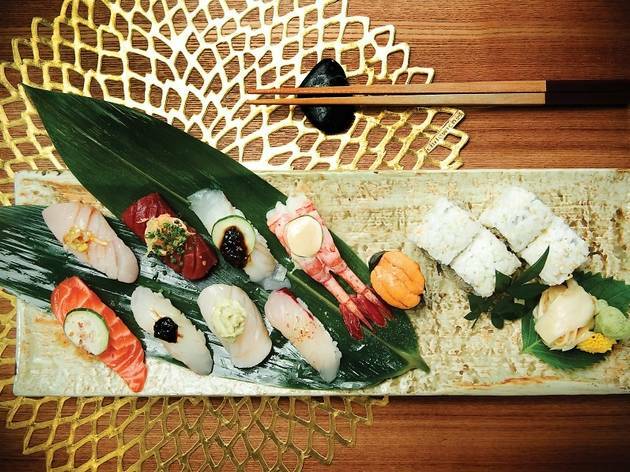 There’s the marbled salmon nigiri doused in nutty sesame dressing, halibut engawa and amberjack with sweet seaweed paste, a milder tasting shima-aji garnished with a swipe of pungent yuzu kosho, plump seared scallop served flat on a shiso leaf, ama-ebi pink shrimp bathed in sweetened soy sauce, tuna with strong miso, arc shell with a runny, relishy mayonnaise and finally, an uni gunkanmaki with a light touch of wasabi. 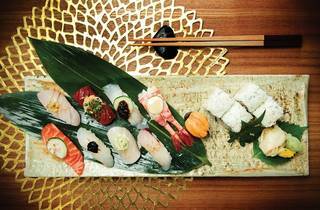 The platter is also padded with four maki rolls filled with diced fatty tuna and, in a slightly more inventive turn, finely chopped raw onions (in place of the standard green Welsh onion) to give it an added and more potent zing. spicy yuzu kosho to throw into the soup if you want to save this dish. Disappointing as the udon is, desserts, it seems, are where Harakan-S really stumbles. The yuzu crème brûlée ($68) tastes neither citrusy nor crème brûlée-ish. The texture lacks smoothness and the sugar crust is soft and chewy instead of being shatteringly crisp. The green tea soufflé ($80) collapses into similar territory. Arriving in a large ramekin, the dessert is light and fluffy with a beautiful puff on the top. It’s a promising first appearance but the centre is too dry, lacking that yielding, custardy core that marks an exemplary soufflé. Still, the most disappointing part about this airy dessert is its meagre matcha fragrance, a sign that the kitchen is either being too scant with its tea or not using a strong enough grade of matcha powder. Shop 311, 3/F, Lee Gardens Two, 28 Yun Ping Rd, Causeway Bay, 2882 8616. Daily noon-3pm & 6pm-11pm.